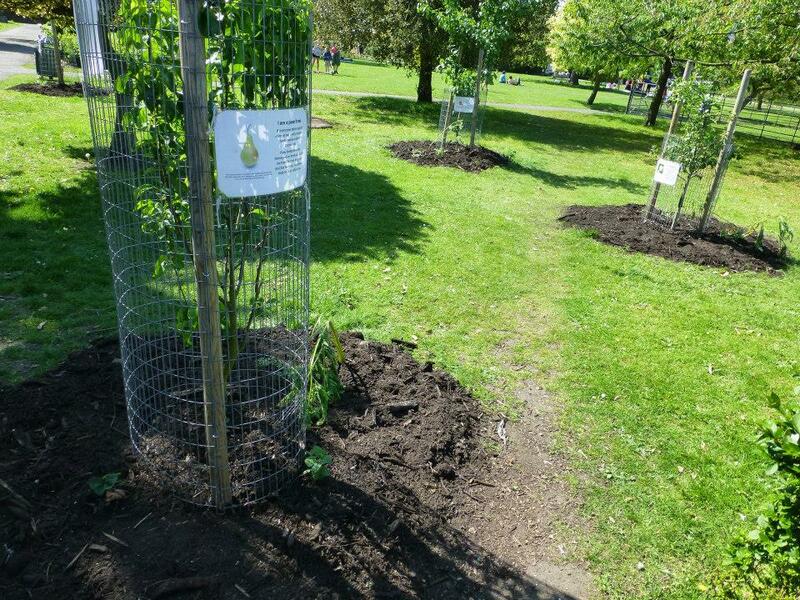 The volunteers who created and care for the East Greenwich Pleasaunce Memorial Orchard tried out some ‘forest gardening’ techniques on 26 May. 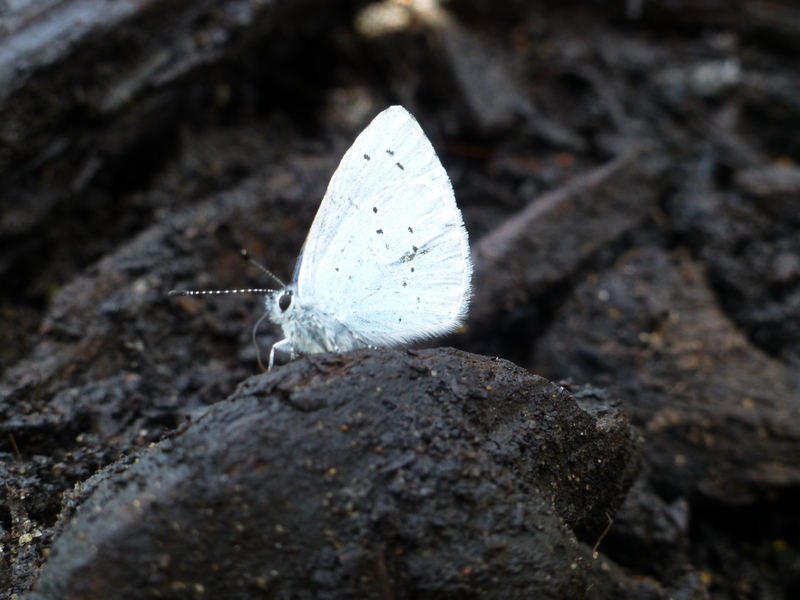 Forest gardening is a permaculture-influenced method of mimicing the structure of a woodland, aiming to make the most productive use of the space available by growing at all levels – the canopy, the shrub layer, ground cover and in the soil. Choosing the right mix of plants can not only provide benefits to the fruit trees but can boost the diversity of life in the area. Comfrey, for example, with its deep tap roots, helps bring nitrogen to the surface, where the fruit trees’ crucial surface roots can access it. Plants such as apple mint and flowering plants help to attract insects that prey on the dreaded aphids, meaning we can avoid chemical treatments – and of course we help support our threatened bee populations too. Nasturtiums can be a ‘sacrficial’ plant, drawing aphids away from the trees, while red clover not only flowers but helps keep back the grass that competes with our trees’ roots. We were treated to blazing sunshine, as well as a new volunteer, and we got a lot done, including fitting grease bands to deter ants, and a welcome refresh of the mulch circles, which, among other things, help the young trees retain crucial moisture. Then, a few days later, two of the group took up a generous offer of collecting free surplus Chelsea Flower Show plants, distributed by the good people at Lewisham Gardens. This allowed us to add still more beauty to the orchard, and others may somehow have ended up lining the platform of Westcombe Park station, thanks to some mysterious guerrilla gardeners. 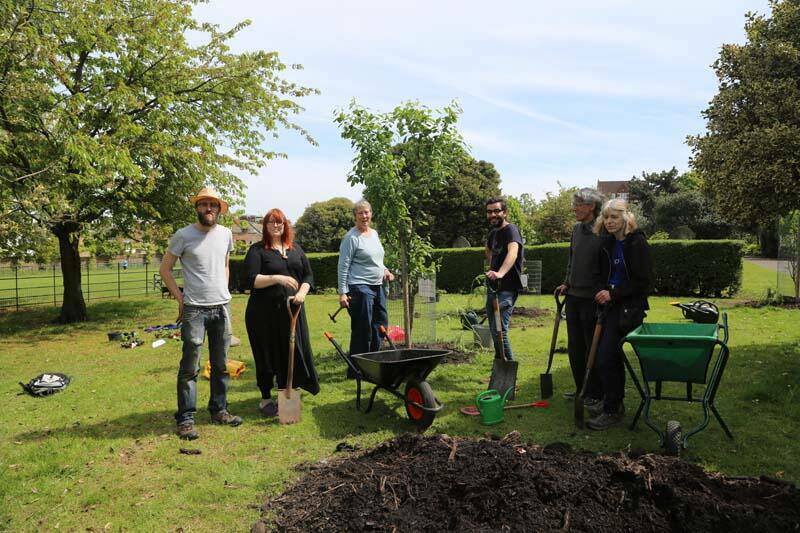 If you’d like to keep up with events and volunteer opportunities at your community orchard, feel free to join our Facebook group.